Background: Previously, MDR1 T-129C polymorphism, encoding multidrug resistant transporter MDR1/P-glycoprotein, was reported to be predictive of poorly-differentiated colorectal adenocarcinomas. Here, VEGF T-1498C, C-634G and C-7T polymorphisms, encoding vascular endothelial growth factor (VEGF), were investigated in terms of their association with differentiation grade. Methods: VEGF genotypes were determined by TaqManR MGB probe based polymerase chain reaction and evaluated were confirmed by direct sequencing in 36 Japanese patients. Results: VEGF T-1498C, but not C-634G or C-7T, was predictive of poorly-differentiated ones, and thereby a poor prognosis (p = 0.064 for genotype, p = 0.037 for allele), and this effect can be explained by that on VEGF expression. Treatment of a colorectal adenocarcinoma cell line, HCT-15, with sodium butyrate, a typical differentiating agent, resulted in an increase of alkaline phosphatase activity and MDR1 mRNA expression, but in a decrease of VEGF mRNA expression. The transfection of VEGF small interfering RNA (siRNA) induced the expression of MDR1 mRNA to 288-332% of the control level, whereas MDR1 siRNA had no effect on VEGF mRNA expression. Conclusions: VEGF T-1498C polymorphism is also a candidate marker predictive of poorly-differentiated colorectal adenocarcinomas, but further investigations with a large number of patients should be addressed to draw a conclusion. Numerous clinicopathological factors have been reported to have prognostic significance for colorectal cancer, including tumor invasion, nodal metastasis, differentiation, and lymphocytic infiltration . The importance of differentiation was already suggested in the 1920s, and the tumors have been graded into well-, moderately- and poorly-differentiated types. Most of colorectal cancers are assessed as well- or moderately-differentiated adenocarcinoma in the Japanese [2, 3]; that is, Takeuchi et al. reported poorly-, moderately- and well-differentiation types were found at 3.3%, 77.2% and 19.5% in adenocarcinomas, respectively. The 5-year survival rate depended on the differentiation grade, and for well-differentiated types was reported to be 71-72%, but in contrast, it was only 32-46% for poorly-differentiated adenocarcinoma in Japanese, although we have rarely encountered this type [2, 3]. Thus, it is important to evaluate differentiation grade accurately to decide a management strategy; however, its usefulness is sometimes thought to be limited due to difficulties in assessment and thereby reproducibility, encouraging us to search for alternative molecular markers , or to establish a method of subclassification . We have been conducting a series of clinical and/or non-clinical investigations to find an invasive, if possible, noninvasive marker predictive of the differentiation and thereby prognosis of colorectal adenocarcinoma [5-7]. 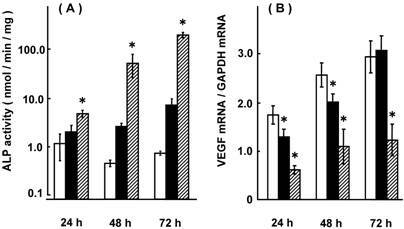 The mRNA expression level of vascular endothelial growth factor (VEGF), an endothelial cell-specific mitogen and survival factor, was analyzed using tissue samples obtained from 18 Japanese patients with colorectal adenocarcinoma, and its association with 12 genotypes of VEGF; C-2578A, G-1877A, T-1498C, T-1455C, G-1190A, and G-1154A in the promoter region, C-634G and C-7T in the 5' untranslated region (5'UTR), and C702T, C936T, C1451T, and G1612A in the 3'UTR, were examined. It was concluded that 1) VEGF mRNA expression was up-regulated in colorectal adenocarcinomas compared to adjacent noncancerous colorectal tissues, 2) C-2578A, G-1154A, and G1612A might be associated with a decreased risk of colorectal adenocarcinoma, and 3) T-1498C (in linkage with G-1190A), C-7T, and possibly C-634G, were associated with higher levels of VEGF mRNA in colorectal adenocarcinomas, but not in adjacent noncancerous colorectal tissues . In contrast, it was found that 1) mRNA expression of multidrug resistant transporter MDR1/P-glycoprotein, the gene product of MDR1, was down-regulated in colorectal adenocarcinomas compared to adjacent noncancerous colorectal tissues obtained from 21 patients , 2) 4 major genetic polymorphisms of MDR1 T-129C in the promoter region, C1236T (silent) in exon 12, G2677A,T in exon 21 resulting in Ala893Thr,Ser, and C3435T (silent) in exon 26 were not associated with disease risk after an analysis of peripheral blood of 48 patients , and 3) T-129C was associated with lower levels of MDR1 mRNA both in colorectal adenocarcinomas and in adjacent noncancerous colorectal tissues . Taken together, it was suggested that VEGF expression would be linked with MDR1 expression, and their genetic polymorphisms might be promising markers of the prognosis of colorectal adenocarcinoma. In this study, VEGF T-1498C, C-634G, and C-7T were evaluated in 36 Japanese patients with colorectal adenocarcinoma, and their associations with differentiation grade were analyzed. A colorectal cancer cell line, HCT-15, was treated with sodium butyrate (NaB), a typical differentiating agent, and alterations of alkaline phosphatase (ALP) activity, an index of differentiation, and VEGF mRNA expression level were assessed. In addition, the effects of VEGF or MDR1 small interfering RNA (siRNA) on their mRNA expression were assessed. Thirty-six Japanese patients with colorectal adenocarcinoma diagnosed at Kobe University Hospital (24 men and 12 women) were enrolled in this study. The average age was age 64.6±9.3 years ( ±SD; range, 34-78). A standard treatment protocol was scheduled, and the data on differentiation grade were obtained from medical records. Informed consent was obtained from all subjects prior to their participation in the study, which was approved by the Institutional Review Broad of Kobe University Hospital, Kobe University, Japan. Genomic DNA was extracted from peripheral blood using a DNeasy Tissue KitR (QIAGEN, Hilden, Germany) according to the manufacturer's directions. In this study, VEGF T-1498C, C-634G and C-7T were determined by TaqManR MGB probe based polymerase chain reaction. The sequences of forward and reverse primers and 2 probes for T-1498C and C-7T, synthesized by Applied Biosystems, Foster City, CA, USA, are listed in Table 1. VEGF C-634G was assessed using a kit (TaqManR SNP Genotyping Assay, part. No. C_8311614_10, Applied Biosystems). The genotypes evaluated were confirmed by direct sequencing using an automatic ABI PRISM 310 Genetic Analyzer (Applied Biosystems) as described in our previous report . The primers used for direct sequencing were synthesized by Hokkaido System Science, Co., Ltd. (Sapporo, Japan). A colorectal cancer cell line, HCT-15 (passage 43), were purchased from Dainippon Sumitomo Pharma Co., Ltd. (Osaka, Japan). HCT-15 cells were maintained in RPMI1640 culture medium (Invitrogen Corp., Carlsbad, CA, USA) supplemented with heat-inactivated 10% fetal bovine serum (FBS; CELLect® GOLD, MP Biomedicals, Irvine, CA, USA). The cells seeded at a density of 3.0×106 cells in 40 ml of culture medium in 175 cm2 culture flasks (NunclonTM, Nalge Nunc International, NY, USA) were grown in an atmosphere of 95% air and 5% CO2 at 37°C, and subcultured every 3-4 days using a mixture of 0.02% EDTA and 0.05% trypsin (Invitrogen Corp.). HCT-15 cells seeded at a density of 4x105 cells in 2 ml of culture medium in a 6-well plate (NunclonTM, Nalge Nunc International) were grown in an atmosphere of 95% air and 5% CO2 at 37°C. After 24 hrs, the culture medium was replaced, and an aqueous solution of NaB, a typical differentiating agent, was added to give a final concentration of 1 or 5 mM for NaB. The volumetric concentration of purified water was less than 0.1%. After another 24, 48, and 72 hr, the cells were washed twice with ice-cold phosphate buffered saline, and cell pellets were prepared. The expression levels of VEGF mRNA were evaluated as described in our previous report . The ALP activity was measured using a commercially available kit (LABOASSAYTM ALP, Wako Pure Chemical Industries, Ltd., Osaka, Japan) in cell lysates prepared with an ultrasonic cell disrupter: the activity was assessed as the rate of conversion from p-nitrophenylphosphate to p-nitrophenol. The transfection of siRNA was performed as reported [8, 9]. siRNA duplexes for VEGF and MDR1 mRNA were synthesized by FASMAC, Co. (Kanagawa, Japan): VEGF (GenBank accession no. NM_001025366): sense (5'-CCA ACA UCA CCA UGC AGA UdTdT-3'), antisense (5'-AUC UGC AUG GUG AUG UUG GdTdT-3'); MDR1 (NM_000927): sense (5'- GGA GGA UUA UGA AGC UAA AdTdT -3'), antisense (5'- UUU AGC UUC AUA AUC CUC CdTdT -3') . Scramble siRNA for VEGF and MDR1 was also designed based on the original target sequence: 5'- UAA CAC AGC ACA CCU ACG UdTdT -3' and 5'-AAG AAG GCA UGG UUG UAA AdTdT-3', respectively. A mixture of 8 µl of OligofectamineTM Reagent (Invitrogen Corp.) and 22 µl of Opti-MEMR I Reduced-Serum Medium (Invitrogen Corp.) was incubated at room temperature for 10 min. After that, 360 µL of Opti-MEMR I Reduced-Serum Medium and 10 µl of 20 µM siRNA aqueous solution were added, and the mixture was incubated at room temperature for 20 min, giving 400 µl of siRNA-Oligofectamine complexes. HCT-15 cells were seeded at a density of 1.5×105 cells/well/2 ml in a 6-well plate. After 24 hr, the cells were washed twice with phosphate buffered saline, and supplied with 1600 µl of Opti-MEMR I Reduced-Serum Medium and 400 µl of siRNA-Oligofectamine complexes. This was followed by incubation for 4 hr. The reagents were replaced with RPMI1640 culture medium, and after another 24, 48, and 72 hr, the cells were collected and subjected to assays of the mRNA expression of VEGF or MDR1. The data on cells treated without siRNA were used as a control. Values are given as the mean ± standard deviation (SD). The association of VEGF allelic or genotype frequencies with differentiation grade was assessed by the Fisher's exact test. For the data on the effect of NaB, multiple comparisons were performed with an analysis of variance (ANOVA) followed by the Scheffé test, provided the variance was similar. If this was not the case, the Scheffé-type test was performed after the Kruskal-Wallis test. For the data on the effect of siRNA, the unpaired t test or the Mann-Whitney's U test was performed. P values of less than 0.05 were considered significant. Table 2 lists the data on the association of VEGF T-1498C, C-634G and C-7T with differentiation grade. VEGF T-1498C, but not C-634G or C-7T, was suggested to be predictive of poorly-differentiated colorectal adenocarcinomas, and thereby a poor prognosis (p = 0.064 for genotype, p = 0.037 for allele). However, statistical analysis without the data of poorly-differentiated ones resulted in no difference (p = 0.153 for genotype, p = 0.128 for allele). Only a small number of patients enrolled in this study, and further investigations should be addressed to draw a conclusion. VEGF, first termed vascular permeability factor (VPF), was discovered in the 1980s [11-16]. VEGF is now recognized to be a member of the VEGF gene family, and in the new system of nomenclature, is defined as VEGF-A [17-19]. VEGF is expected to be involved in the pathogenesis of cancer metastasis, retinopathy, age-related macular degeneration, rheumatoid arthritis, and psoriasis, and clinical observations have confirmed that VEGF expression in solid tumors is predictive of resistance to radiotherapy, chemotherapy, and endocrine therapy [17-19]. In patients with colorectal cancer, VEGF expression has been found to be associated with disease progression, microvessel density, venous invasion, lymph node and/or liver metastasis, and prognosis [20-24], although reports have not always provided similar conclusions [25, 26]. In our previous report, VEGF T-1498C was found to be linked with higher levels of VEGF mRNA in colorectal adenocarcinomas . The association of VEGF T-1498C with poorly-differentiated type as shown in Table 2 can be explained by its effect on VEGF expression, although differentiation grade-dependent VEGF expression was not demonstrated in our samples. The VEGF gene is located on chromosome 6p21.3 and comprises a 14-kb coding region with 8 exons and 7 introns, and alternative exon splicing results in the production of 4 major and several minor isoforms [17-19]. The genetically controlled variation in the production of VEGF was examined in peripheral blood mononuclear cells (PBMCs) or plasma [27-30]. C-2578A , G-1154A , and C936T [29, 30] were found to result in lower levels of VEGF production, and have recently been suggested to be associated with a reduce risk of breast cancer , prostate cancer , and cutaneous malignant melanomas . Compared with C-2578A, G-1154A and C936T, little information is available for T-1498C. In Japanese, the TT/TC/CC ratio was reported to be 44.1%/48.3%/7.6% for type 2 diabetic patients without retinopathy , and to our knowledge, no information was presented for healthy subjects, and T-1498C was expected to be less frequently found in Japanese than other races . The TT/TC/CC ratio was 44.4%/38.9%/16.7% in Japanese patients with colorectal adenocarcinomas (Table 2), and T-1498C would not be a marker of susceptibility. Previously, MDR1 T-129C, but not G2677A,T or C3435T, was found to result in lower levels of MDR1 mRNA both in colorectal adenocarcinomas and in adjacent noncancerous colorectal tissues . Relatively weak expression was suggested in moderately-differentiated compared to well-differentiated colorectal adenocarcinomas . No significant association was observed for the dependency of grade of differentiation on MDR1 expression, presumably because poorly-differentiated colorectal adenocarcinomas are infrequent in Japanese , but Potocnik et al. indicated lower levels of MDR1 expression in poorly-differentiated than well-differentiated colorectal cancers obtained from Slovenia patients, with intermediate levels of expression for moderately-differentiated cancers. Collectively, it was concluded that MDR1 T-129C might be predictive of poorly-differentiated colorectal adenocarcinomas, and thereby a poor prognosis . MDR1 is a glycosylated membrane protein of 170 kDa, belonging to the ATP-binding cassette superfamily of membrane transporters [35-40]. MDR1 was originally isolated from resistant tumor cells as part of the mechanism of multidrug resistance. Human MDR1 has been found to be expressed throughout the body to confer intrinsic resistance to the tissues by exporting unnecessary or toxic exogenous substances or metabolites. Recent investigations have challenged the notion that MDR1 has evolved merely to facilitate the efflux of xenobiotics and have raised the possibility that MDR1 plays a fundamental role in regulating apoptosis. Given the down-regulation of MDR1 expression during the differentiation of pluripotent stem cells along the myeloid lineage in 1991 , its potential implications in cell systems resulting in cell death or differentiation have been discussed for the last decade. Recently, we and Goto et al. have found that MDR1 mRNA expression is down-regulated in a human colon carcinoma cell line, Caco-2, prior to the up-regulation of the expression of villin mRNA, a marker of differentiation [42, 43]. A lower level of MDR1 mRNA in adenocarcinomas than adjacent noncancerous tissues suggests its down-regulation as a consequence of the malignant transformation of colorectal tissues, possibly with the suppression of differentiation . Lower levels of MDR1 in cancerous tissues than the adjacent normal tissues were also reported in French patients with renal cell carcinoma  and Japanese patients with colorectal carcinoma , but the opposite result was obtained in French patients with advanced breast carcinoma . Poorly-differentiated types are found in 13.8-17.5% of Caucasians [47, 48], more frequent than in Japanese, suggesting a difference in the nature of the cancer between Caucasians and Japanese. Further clinical investigations might be needed to conclude the usefulness of MDR1 T-129C with regards to predictions of prognosis. Compared with adjacent noncancerous colorectal tissues, VEGF mRNA expression was up-regulated, but MDR1 mRNA expression was down-regulated in colorectal adenocarcinomas, suggesting their linkage [5, 6]. Fig. 1 shows the effect of NaB on ALP activity and VEGF mRNA expression in HCT-15 cells. ALP activity increased in a NaB-concentration and treatment time-dependent manner, and VEGF mRNA expression was suppressed as ALP activity increased. In our previous report, treatment with NaB resulted in an up-regulation of MDR1 mRNA expression . Fig. 2 shows the effects of transfecting VEGF siRNA on the mRNA expression of VEGF and MDR1 in HCT-15 cells. VEGF mRNA expression was suppressed; indicating a successful transfection of VEGF siRNA, and under these conditions, MDR1 mRNA expression was increased to 288-332% of the control level. Fig. 3 shows the effects of transfecting MDR1 siRNA on the mRNA expression of VEGF and MDR1. 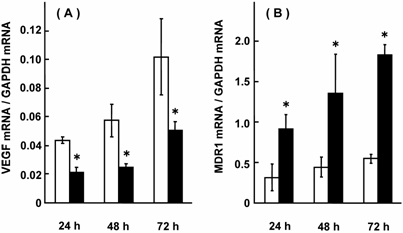 MDR1 mRNA expression was suppressed, but VEGF mRNA expression was not altered. It should be that scramble siRNA for VEGF and MDR1 had no effect on the expression of either mRNA (data not shown). Taken together, it could be said that VEGF itself or the factors resulting in production of VEGF had a suppressive effect on MDR1 expression, suggesting that cancer patients with a higher VEGF expression will show a relatively high sensitivity for MDR1 substrates, including vinca-alkaloids, anthracyclines and taxanes. Considering that a number of factors affect MDR1 expression [35-40], VEGF expression and/or genetic polymorphisms of VEGF were thought to be superior. In summary, VEGF T-1498C, but not C-634G or C-7T, was predictive of poorly-differentiated colorectal adenocarcinomas, and thereby a poor prognosis. This effect can be explained by that on VEGF expression. In vitro experiments using HCT-15 cells have suggested that VEGF expression was linked with MDR1 expression. MDR1 T-129C was also reported to be predictive of poorly-differentiated colorectal adenocarcinomas, and VEGF T-1498C polymorphism is also a candidate marker, but further investigations with a large number of patients should be addressed to draw a conclusion. Effect of NaB on ALP activity and VEGF mRNA expression in HCT-15 cells. HCT-15 cells were treated with 1 or 5 mM NaB for 24, 48, and 72 hr, and ALP activity and VEGF mRNA levels were assessed. The results were expressed as the mean ± SD of 4 independent experiments. (A) ALP activity, (B) VEGF mRNA. Open column: control (0 mM NaB), closed column: 1 mM NaB, hatched column: 5 mM NaB. *: p < 0.05, when compared with the control experiment. Effect of VEGF siRNA on mRNA expression of VEGF and MDR1 in HCT-15 cells. HCT-15 cells were treated with VEGF siRNA for 24, 48, and 72 hrs, and mRNA expression levels of VEGF and MDR1 were assessed. The results were expressed as the mean ± SD of 3-4 independent experiments. (A) VEGF mRNA, (B) MDR1 mRNA. Open column: without VEGF siRNA, closed column: with VEGF siRNA. The scramble siRNA for VEGF had no effect on the mRNA expression of VEGF or MDR1. *: p < 0.05, when compared with no VEGF siRNA. 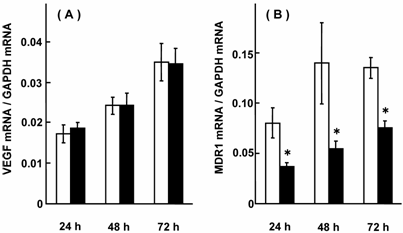 Effect of MDR1 siRNA on mRNA expression of VEGF and MDR1 in HCT-15 cells. HCT-15 cells were treated with MDR1 siRNA for 24, 48, and 72 hr, and mRNA expression levels of VEGF and MDR1 were assessed. The results were expressed as the mean ± SD of 3-4 independent experiments. (A) VEGF mRNA, (B) MDR1 mRNA. Open column: without MDR1 siRNA, closed column: with MDR1 siRNA. The scramble siRNA for MDR1 had no effect on the mRNA expression of VEGF or MDR1. *: p < 0.05, when compared with no MDR1 siRNA. This work was supported in part by a Grant-in-Aid for Scientific Research from the Ministry of Education, Culture, Sports, Science and Technology, Japan, and by a research grant from Uehara Memorial Foundation, Japan.